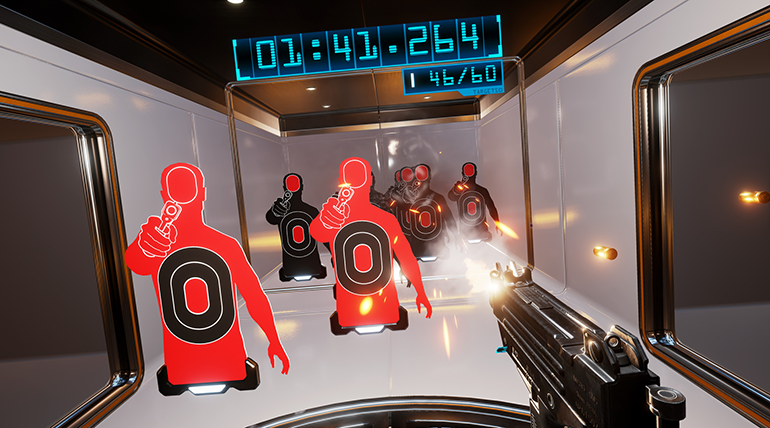 When a bunch of former Burnout leads started work on Lethal VR this summer, they called up the NRA. Not the American branch, who were rather busy at the time buying TV ads for the new president-elect, but the Bisley-based UK governing body of full bore rifle and pistol shooting. For those of us who don’t know, it turns out to be a tightly controlled experience. It’s about lying prone with a rifle and shooting a distant bullseye. It’s about waiting for a man stood a very long way away to hold up a flag indicating whether you hit or missed. It’s less like Keanu Reeves, stood in an FBI training range in the rain, whack-a-moling targets as they pop up. When Three Fields described that scene from Point Break to the nice man at the NRA, they discovered that the Hollywood kind of practice shooting is very difficult to do in real-life, and rarely features in competition. All the more reason, then, to do it in the Vive. 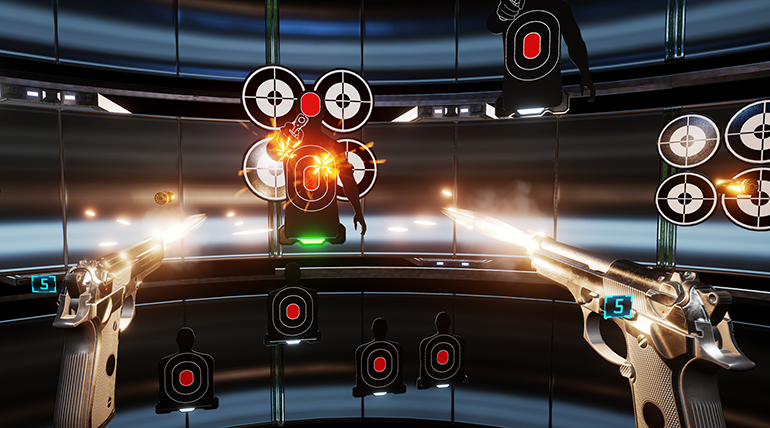 Lethal VR sits somewhere between the silly shooting range you see in the movies and the Saturday Night Live version. It’s about holding a pistol out in front of you, readying to fire and, just for a split-second, pausing. Is that wooden old lady packing a handbag or a handgun? “It’s training you to have that response where you have to hesitate before you pull the trigger,” explains Ward. It’s also about hearing a target pop up behind you, and spinning to face it. Not beholden to the sensible safety rules of the Bisley NRA, Three Fields have built levels that take full advantage of the Vive’s 360-degree view. The setting was inspired by technical limitations. The studio - who paused work on a new spiritual successor to Burnout when Epic sent them a handful of Vive kits in the summer - knew they wanted to put together an action game. But they also knew it needed to run at 90 fps. Ward, art director Paul Phillpot and designer Chris Roberts sat down at a table and mapped out their vision for the game in a single session. Veteran game developers lay on the floor, and pretended to pew-pew around corners. They kneeled in the office and sprayed invisible bullets all around. They discovered that play-shooting involves plenty of actions you’d never attempt in real-life - and so returned to John Woo films like The Killer and Hard Boiled. 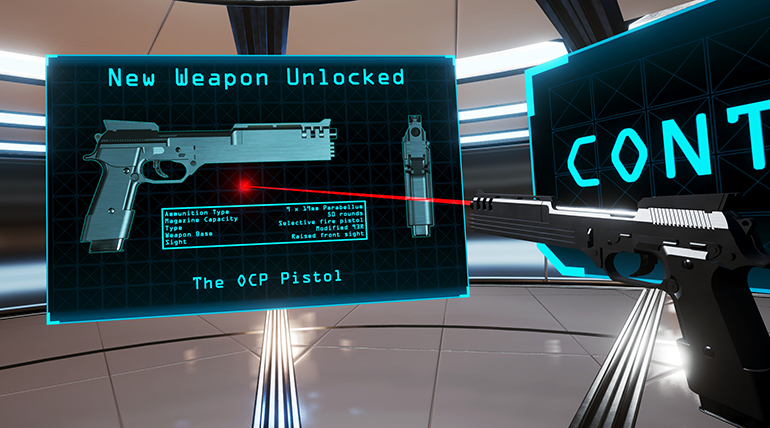 The resulting game - built in Unreal Engine 4 for its dedicated VR tools that make it “really easy to get started” - is unabashed wish-fulfillment. It’s about shooting Dirty Harry’s magnum in everything but name; firing a knock-off golden gun; hearing the “wobbly diving board” impact as a knife just like Crocodile Dundee’s hits its target. And just a few months on from that fateful afternoon, Lethal VR is finished and out on Steam. A silly fantasy fit for Christmas. 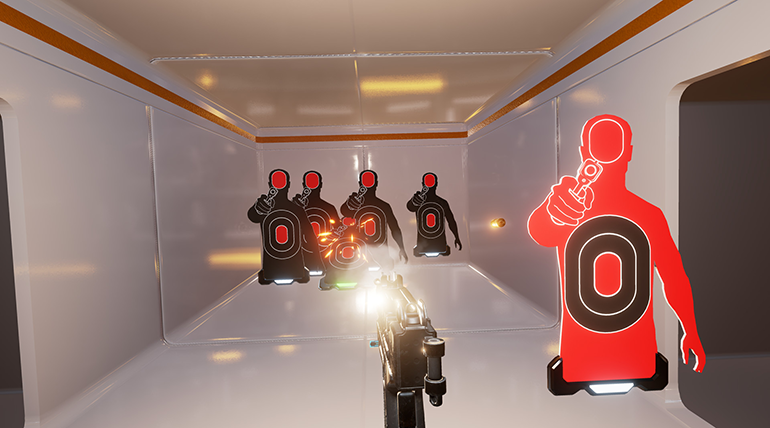 Lethal VR is out now for the HTC Vive. Unreal Engine 4 is now free.